Mosaic Miro has developed a special interlock system to place prefabricated mosaic mats or tiles easily. The mats can be linked to one another with a tooth-edged interlocking system, creating a seamless random pattern. 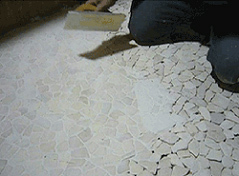 This way, anyone can create the most beautiful mosaic floors without any visible tile pattern. Make sure your base material is solid. Preferably concrete, plaster, gypsum, wood or any different stable surface. Also make sure the surface is clean, smooth and levelled before you start. 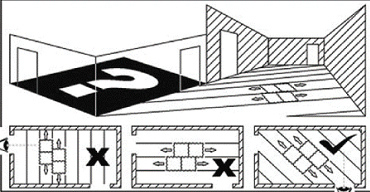 With this interlock system it is possible to place the mats interlocking, preferably laid down in a stretcher. We highly recommend our method of placement which provides the best result. See also the drawing added. The add ribbon should be set square to the direction from which the floor will viewed the most. You can work in any direction you prefer. If placed correctly, the joints are invisible after grouting. The add ribbon may remain more or less visible between two rows of tiles after instalment. In such a case use a sharp knife to cut a few strategically chosen tiles clear of the mat and turn them in direction to break any remaining visible pattern. Do this immediately after any new applied row. This way, the glue hasn’t dried completely. Using this method, any joint still visible will become invisible. Therefore any recognizable pattern will vanish completely which will create a random pattern rather than a recognisable pattern. Define the direction from which the room concerned is usually experienced. The line of the edge joint must differ as much as possible from that direction. The optimum is achieved if the edge joint is square to the direction from which it is usually looked at (see the illustrations in ‘Application instruction’). Draw a baseline (or wire) somewhere in the middle of the surface (floor or wall) on which you are going to apply the mosaic (see illustration). Open several packages with tiles and put the tiles together, rather than working package by package. Apply a strip of tile glue on the surface, across the width of the tile. Spread the glue evenly using a glue comb of 6mm at most. Press the tiles against one another using both hands. Manoeuvre the tiles until they fit well. Knock the tile flat into the glue to fit tightly into the previous tile or against the base line, using a grout float. Repeat this process across the entire line. Any glue remaining on the tiles should be quickly removed by using a wet sponge. Make sure the tiles fit tightly together to avoid gaps between rows. Mosaic Miro products need to be installed meticulously to achieve the best possible result. See important advice above! The mats can be made to fit precisely to any edge in your space or to another material. To do so, measure to define the size and fitting shape and use a grinding disc or wet saw to cut any tile into size. If necessary, smoothen the edges using steel wool. In case you want to apply fitting stones on a small scale you can do it one by one using a pincer. 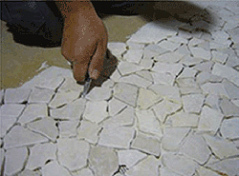 Note that when faced with surfaces larger than one tile, it is always preferable to cut tiles or mats, rather than apply loose pieces of stone. The latter is much more difficult. Which grouting material is suitable? The grouting material or cement should be suitable for natural stone in the first place. Any grouting material for joints of 0 to 10mm and with a certain flexibility can be used. Check the specifications for dry and wet conditions and/or other aspects that may be relevant to the situation where the Mosaic Miro products are being applied. Note that also the colour of the grouting material can make a big difference in visual effect. Most used are colours close to the applied product. When having doubts about colours or applications, make a test setting first. Working clean is crucial in every step of the process. Therefore any spilled grout or glue should be removed immediately during application. For cleaning, gently wipe the surface with a slightly wet sponge until the excess glue or grout is removed. Cleaning will be much harder, though not impossible, when the cement has fully dried and the joints have hardened. Clean the wall or floor thoroughly once again after all has dried. To do so use a soft non-acid soap or special cement remover in case of any remaining grout spills. We strongly recommend that you impregnate the wall or floor to combat dirt as much as possible and to facilitate cleaning. You can choose for a matt or glossy appearance. Suitable products can be found in any professional tile shop. Needless to say the material used should be suitable for natural stone. In all cases natural wax or any natural oil is a more natural way of impregnating. For more moist areas like spa’s, swimming pools or shower floors you can even seal the floor completely with two component sealants, available at the market. Note that after impregnation the colour of the product will appear different, more dark. Best is to test application on a test piece, before definitive application. This way, disappointments are prevented. All Mosaic Miro products are applicable without these treatments. They keep their natural colours. Time and use will smoothen the surface eventually. Also note that sunlight affects colour in the long term. For a more glossy appearance you can polish the surface as terrazzo or with a wax as any other natural stone. After instalment the product is easy to maintain. When cleaning, always use a non-acidic cleaning solution which is suitable for natural stone. We hope you will enjoy the final result for many years. This extra attention in application will make a big difference. When having any doubts, requests or questions see also the FAQ at our website or contact us by email.